Sometimes you just can’t wait. That is exactly why Sam Levitz Furniture can bring you your furniture & mattress purchase on the Same Day or the very Next Day*. To ensure consistent service, Same Day and Next Day Deliveries are confined to the immediate Tucson area. For your convenience, you'll be able to select a 4-hour delivery window at the point of sale. To ease the wait-at-home time, our delivery drivers will call you a minimum of 30 minutes prior to their arrival. Additional, our easy-to-use Delivery Tracking feature, found above, is a great way to track real-time delivery progress and ETA's. 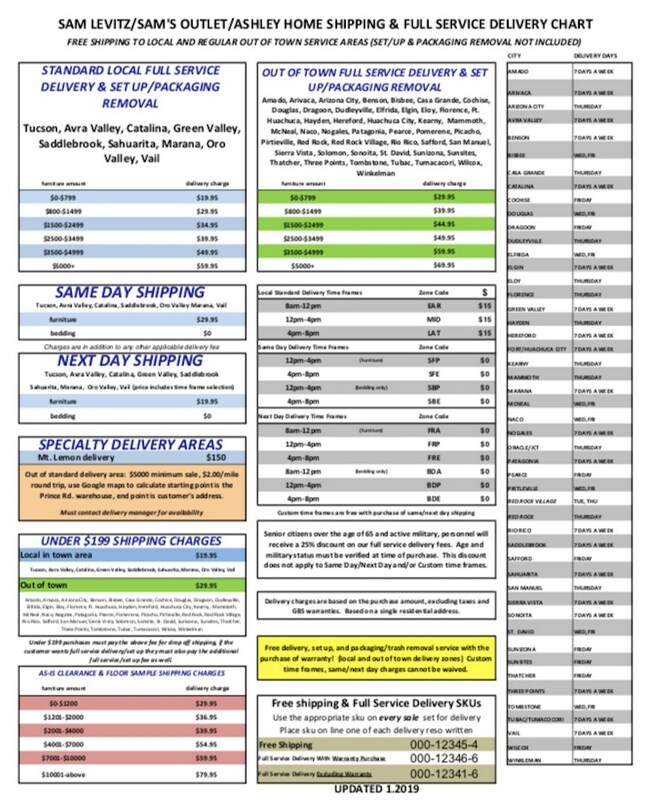 Please note: delivery tracking is only available on the day of delivery after the truck has departed our distribution center. When scheduling your delivery, please acknowledge that an adult will be on site at the delivery address. Sam Levitz Furniture will not be able to proceed with any delivery where an adult is not present. *Next Day Delivery Service is available on in-stock purchases made by the close of business. *Same Day Delivery Service is available on in-stock purchases made by 2:00 pm. To ensure efficient operation and guarantee the lowest price to our customers, our deliveries are scheduled a minimum of 72 hours in advance. Our Delivery Department will contact you via text, e-mail, or phone call to confirm your delivery. A delivery confirmation is required. To ease the wait-at-home time, our delivery drivers will call you a minimum of 30 minutes prior to their arrival. When scheduling your delivery, please acknowledge that an adult will be on site at the delivery address. Sam Levitz Furniture will not be able to proceed with any delivery where an adult is not present. Free Shipping is delivery to your room of choice, not including set-up or trash removal. $199 minimum purchase. Excludes cash & carry, accessories, lamps and clearance center items. Full service delivery & set-up for as low as $19.95. In-stock mattresses purchased by 2pm for Same Day Delivery & close of business for Next Day Delivery. Applies to local delivery zones only. Excludes Clearance Center Mattresses. If more than mattresses are purchased, only the mattress may qualify for free delivery. We pride ourselves on over 60 years of building great relationships with our customers. We understand that a successful delivery is paramount. It is our customers that continue to make us #1 in Southern Arizona. We appreciate you, and we are here to help! For all other questions related to previously delivered merchandise please call our Customer Service Department at (520) 629-4504. Either department will be pleased to assist you and make your delivery a convenient and pleasurable experience. Your satisfaction is important to us. To measure our performance, a customer service representative will contact you to rate your delivery. We value your comments and suggestions. If you provided us with an e-mail address, you will be sent an online survey which may be submitted at your convenience. Senior citizens over the age of 65 and active military personnel will receive a 25% discount on our delivery fees. Age and military status will be verified at time of purchase.